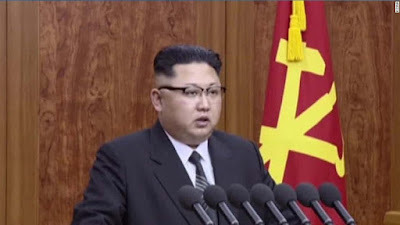 The North Korean elite are expressing their discontent toward young leader Kim Jong Un and his government as more outside information trickles into the isolated country, North Korea’s former deputy ambassador to London said Wednesday. Thae Yong Ho defected to South Korea in August last year and since December 2016 has been speaking to media and appearing on television shows to discuss his defection to Seoul and his life as a North Korean envoy. “When Kim Jong Un first came to power, I was hopeful that he would make reasonable and rational decisions to save North Korea from poverty, but I soon fell into despair watching him purging officials for no proper reasons,” Thae said during his first news conference with foreign media Wednesday. Thae, 54, has said publicly that dissatisfaction with Kim prompted him to flee his post. Two university-age sons living with him and his wife in London also defected with him. North and South Korea are technically still at war because their 1950-53 conflict ended in a truce, not a peace treaty. The North, which is subject to UN sanctions over its nuclear and missile programs, regularly threatens to destroy the South and its main ally, the United States. Thae is the most senior official to have fled North Korea and entered public life in the South since the 1997 defection of Hwang Jang Yop, the brains behind the North’s governing ideology, “Juche,” which combines Marxism and extreme nationalism. Today’s North Korean system had “nothing to do with true communism,” Thae said, adding that the elite, like himself, had watched with unease as countries like Cambodia, Vietnam and the former Soviet Union embraced economic and social reforms. Thae has said more North Korean diplomats are waiting in Europe to defect to South Korea. North Korea still outwardly professes to maintain a Soviet-style command economy, but for years a thriving network of informal markets and person-to-person trading has become the main source of food and money for ordinary people. Fully embracing these reforms would end Kim Jong Un’s rule, Thae said. Asked if Kim’s brother, Kim Jong Chol, could run the country instead, Thae remained skeptical. “Kim Jong Chol has no interest in politics. He is only interested in music,” Thae said. Of particular concern is Thae Yong Ho's assertion (toward the end of the video) that Kim Jong Un would readily press the nuclear button if he saw his regime threatened. North Korea already possesses nuclear warheads and is in the process of testing missiles that could soon have the capability of reaching the United States.